A touching story that uses the powerful yet accessible symbol of an empty egg to demonstrate the concept of complete forgiveness. The Sparkle Egg is a tool which will help readers and their families start a new Easter tradition. Buy now for only $13.59. I was first introduced to Ideal Books and author Jill Hardie back in Dec. of 2012. As my of my annual Christmas Gift Guide, I shared a review of Jill's holiday book, "The Sparkle Box." If you missed my review or want to learn more about this book, click here now -- http://www.inspiredbysavannah.com/2012/12/holiday-gift-ideas-sparkle-box-by-jill.html. Recently, I was sent another wonderful holiday book from Jill Hardie, to include in my Easter Gift Guide called "The Sparkle Egg." As with Jill's previous book, which reminded us about the true meaning of Christmas and how it is better to give than to receive, "The Sparkle Egg" has a message of forgiveness, which children of all ages will enjoy reading or having read to them. I don't know about you, but when the holidays roll around, I sometimes find myself getting lost in the festive activities of the season, and have to stop and remind myself why we are celebrating a certain holiday. My girls are getting to the age that they are starting to enjoy the holidays, and with Easter fast approaching, I have been stocking up on plastic Easter eggs to fill and hide on Easter morning, as well as picking up egg dying kits to decorate eggs with them. But, thanks to this book, I was able to take a step back and remind myself, and share with the girls why we celebrate Easter and to make sure we thank God for all that we have and ask for forgiveness when we do something wrong. In this story, we meet a boy named Sam, who does poorly on a spelling test. Instead of getting a gold star that he was hoping for, he feels ashamed for his poor performance. When he arrives home from school, his mom asks him how he did on the test. He lies and tells her he got a gold star, but forgot the test at school, so he couldn't show it to her. It wasn't until the next day when Sam's parents attend a parent-teacher orientation that they find out from the teacher that Sam did poorly and didn't receive a gold star, like he had told them. His mother asks him why he lied. Sam apologizes for lying to his parents and even asks God for forgiveness. But, for the next week he finds himself carrying around this guilt and being able to live life to its fullest, or letting God's light shine through. It isn't until his mother sits him down and has him create a Sparkle Egg, which he embellishes with glitters, sparkles and more. She tells her son to draw a picture or write something down on a sheet of paper that he feels sorry about or ashamed. Sam ends up drawing a gold star, to go along with his lying about receiving this on the spelling test. He then folds the paper up and puts inside the egg. His mom tells him that on Easter morning he will find a special surprise in the egg. Sam rushes to check his basket and more specifically the Sparkle Egg on Easter morning. He is saddened and confused when he finds the egg empty. His parents sit him down and tell him that the empty egg represents all that is forgiven in God's eyes. Jesus died and rose again so that we could live on eternally. And, like the empty tomb that first Easter Day, this is why Sam's egg is empty. Sam's wrongdoing of telling a lie was completely forgiven by God. And, once Sam realizes that he is forgiven and accepts this forgiveness fully, then he will truly be able to sparkle and shine with God's light. If we carry around shame and guilt like Sam did, we can never really receive all God's gifts and shine. But, once we let go of our guilt and understand that God forgives us completely, then we can truly live a happier and more spiritual life, one that God wants us to live. It is hard to find touching stories like this one that you can share with your children, and discuss the meaning of it afterwards. And, while many children think of Easter as fun egg decorating, Easter egg hunts and baskets full of candy and goodies, they also have to understand why Easter is really celebrated and the sacrifice Jesus made for us. With this book, you can sit your children down and share the true meaning of Easter. And, thanks to Jill and her idea of the "Sparkle Egg," you can start a new tradition with your children, as a way to symbolize the true promise of Easter, and how we have to forgive ourselves fully in order to open ourselves to God's purest of light and be able to spark and shine like God wants us to. While my girls are still too young to really appreciate this story and for us to start a tradition of creating a Sparkle Egg for Easter, I will definitely be keeping this book handy for when the time comes. I love this idea and especially love the message Jill shares with her book. 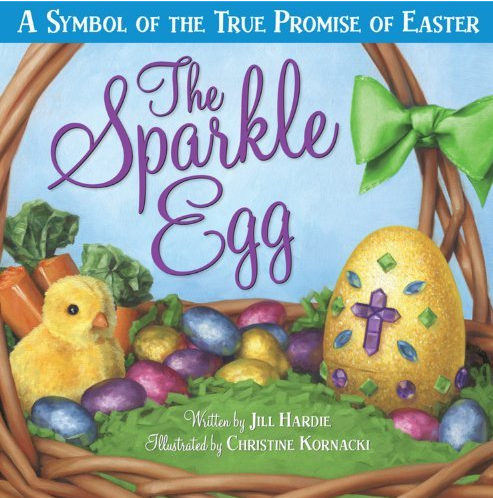 If you are looking for a new tradition to start with your family, or simply want to share the true promise of Easter, then you will want to check out "The Sparkle Egg" by Jill Hardie. "The Sparkle Egg" is a symbol of the true promise of Easter, and how God sacrificed his only son so that those who believe in him with have an eternal life. Note: Only one entrant per mailing address, per giveaway. If you have won the same prize on another blog, you are not eligible to win it again. Winner is subject to eligibility verification.